With Allen Sports New Bluetooth Stereo Headphone you can leave your MP3 player at home but still listen to music and answer phone calls while you ride. And the unit is wireless. Download your favorite tunes to your cell phone, and the wireless headset that comes with the Allen Sports Bluetooth Stereo Headphone will play the music for you in crystal clear digital sound. Plus, when a call comes to your cell phone you can answer it at the press of a single button. The unit easily clips to a jersey pocket or hydration pack and weighs in at a miniscule 29 grams. The Allen Sports Bluetooth Stereo Headphone, which won the Consumer Electronic Show Design and Innovations Award, is the first of its kind to function together as a stereo headset, a mono headset and as an HCI dongle when charging so users can transfer files with ease. The unit is Bluetooth Compliant V2.0, comes with three different sized gel ear buds for added comfort and a quick-charge wall charger. Charge time is 70 minutes and the unit can play music for 13 hours and you can talk for 15 hours. MSRP is $119.99. "We were very excited when we saw the Allen Sports Bluetooth Stereo Headphone at Interbike this year," says Karen Peterson of Lexco. "The unit is compact, lightweight, and has beautiful sound. It is perfect for cyclists who likes to listen to music while they ride but dont want to take both a cell phone and an MP3 player with them. Plus, the Allen Sports Bluetooth Stereo Headphone is a great holiday gift so dealers should order their units now." Says Alex Allen of Allen Sports: "With the proliferation of MP3 enabled cellular phones on the market, we see tremendous opportunity for our Bluetooth Stereo Headset. 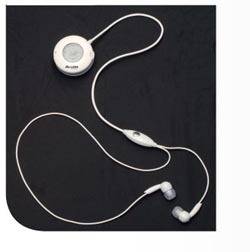 It is designed for the active sports participant: it gives you complete control over your phone, it offers great battery life, and it allows cyclists to get rid of a stand alone iPod or an MP3 player. Lexco is the right source for this innovative item." Security: Digital encryption for secure conversations. Battery: 300 mAh Li-Polymer battery. Operating range: up to 10 Meter. Size: 46 mm diameter x 22 mm thickness.